Flowers often produce these warty and somewhat edible fruits (berries) by autumn. 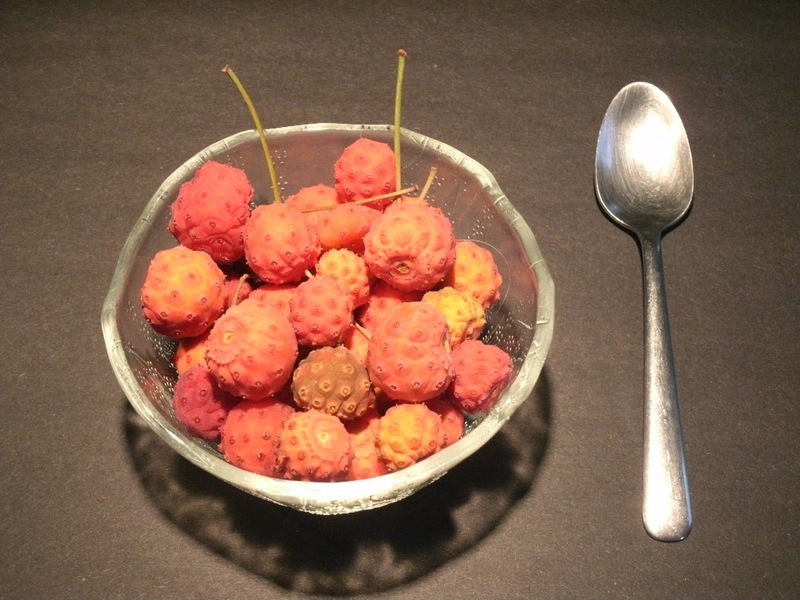 I profiled these soft fruits that have a mealy consistency in a post titled "Maybe you do need a scoop of vanilla ice cream... Fresh Toronto Cornus kousa fruits in the raw!" Likely the squirrels and birds will eat them before you can harvest them. I tried eating one and, while edible, wasn't an amazing gourmet experience! Cornus kousa's fall foliage is very ornamental as shown above. Colours range from plums, wines, russets, oranges and golds on the same tree. Common cultivars we see in Toronto include "Satomi" with pink bracts and "Wolf Eyes" which has wavy variegated leaves. They can be planted as small-medium sized trees, shrubs and standards and can fit into most landscape garden styles. Cornus kousa prefers full sun (6 hours of direct sun) with ample watering in the first several years after transplanting. My tree takes care of itself more or less, no fertilizing required and is pest free. Just leave it alone to achieve its natural vase shape and don't prune them into meatballs!